Stud, S, 7/16-14NC x 7/16-20NF-2 x 3 7/16. 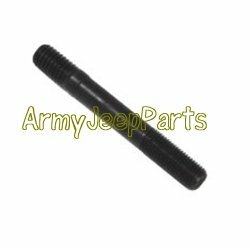 WO-349368 Early to mid WWII jeeps use 5 of these & for M38's 12 of these studs plus long studs for the engine lift plate. We also have the special tall large nuts for these studs.